I love travel and I’m also a coffee lover. So you can imagine my pleasure when, after a hard day of visits and sightseeing, I can finally take a rest and enjoy a good coffee. What’s even better? If I can enjoy it with an amazing view! Here are the best places where I have drunk a coffee with a nice view. Be advised that I select these places for the view, and not for the quality of the coffee. Even though for an Irish one, it wasn’t so bad. Near Cork, on the south west of Ireland, there is a little lovely town called Cobh. Famous to be full of American tourist during summertime, it was also the Titanic’s last port of call before its first and last voyage to New York. Next to the new Titanic museum, you can find a Pub – Restaurant which is called “Titanic Bar and Grill”. Indeed in Ireland, you can find a Pub next to every single touristic building, if it’s not inside the building directly! The last time I ate there, my lunch was as disastrous as the Titanic’s travel. 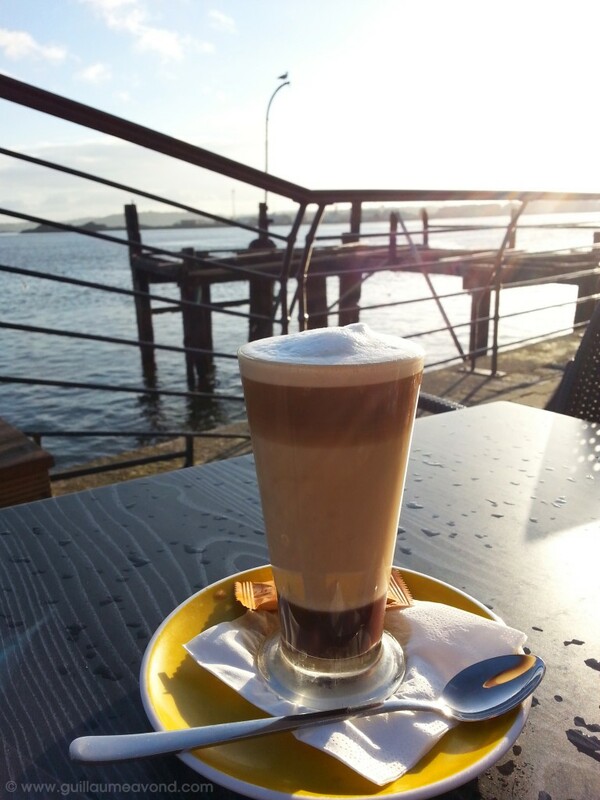 But if you only want a coffee, that is the perfect place to have one in Cobh. If you are lucky enough to be in Ireland during a sunny day then … you are lucky enough! Prepare your sunglasses and enjoy the big outside terrace right in front of the sea. You will also be able to see the original Titanic’s boarding pier which is standing there since more than 100 years! And if you want to be at 100% in the Titanic mood, bring your Ipod and listen “My Hearth Will Go On” of Céline Dion while you are there! Don’t lie to me, I know it’s your favourite song! 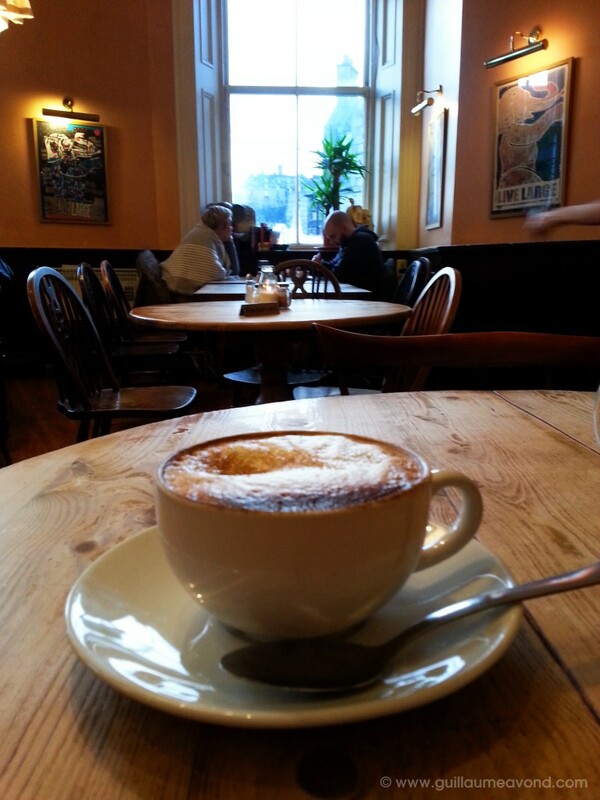 This little Indian-style coffee house looks basic from outside but have a great view on the wonderful Edinburgh castle from the back room. That’s probably why J.K. Rowling was used to drink her coffee there, admiring the view while she was writing Harry Potter. The legend even say that she got the idea of this money-maker novel in this coffee house! Indeed if you look at Edinburgh Castle after have drunk few glasses of a local Scottish whiskey, I recognized that it looks like Hogwarts. Don’t forget to have a look at all the Harry Potter style graffiti made by the stupid tourists on the toilet’s wall, it’s quite funny! London is full of secret places well-hidden, but this one is quite easy to find although most of the tourists don’t know it. This rooftop bar is located just above the HMS Belfast warship visitor entrance and it will give you a spectacular view on Tower Bridge! Don’t worry, you don’t need to visit the museum and pay the very-expensive ticket (except if you are a fan of the British Marine) to enter the bar. 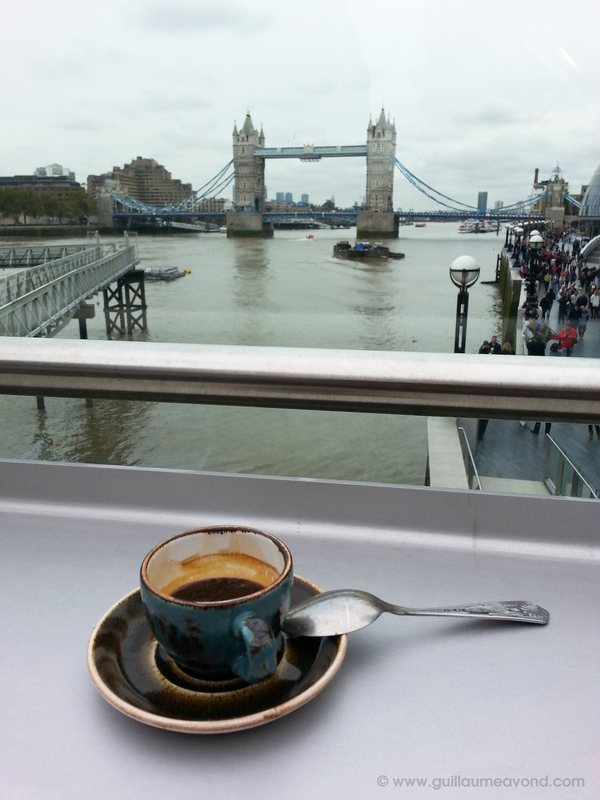 Moreover the coffee is quite good and not so expensive, which is unusual in London. It is also a surprising relaxing place to have a rest in this ultra-busy city without leave the centre and you may even enjoy the British sun (No I’m joking, there is no sun in England)! I couldn’t finish this ranking without speak about one of the best countries for coffee: Italy! 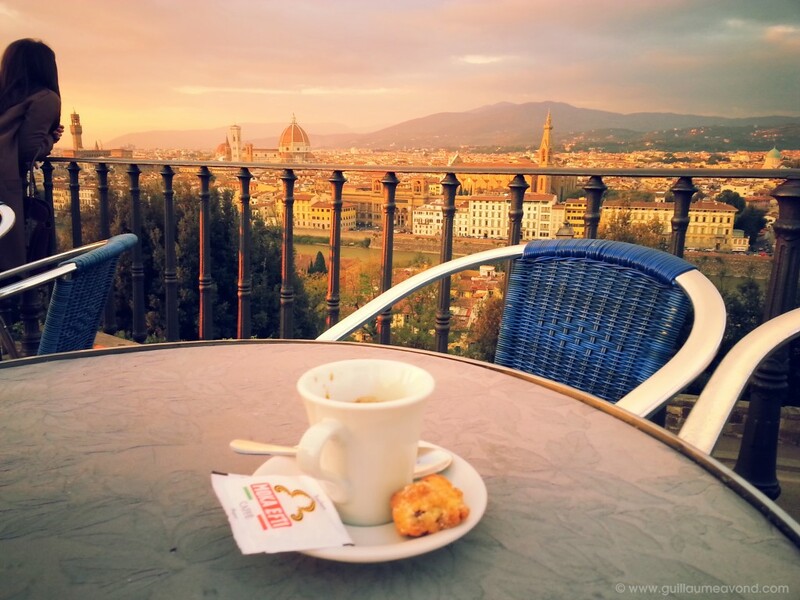 The city centre of the wonderful city of Florence is a kind of open-air museum and is full of great coffee shops. Most of them will extort your money but anyway that is a problem in all the touristic cities, and especially in Italy, isn’t it? But if you have time, get out of the centre, cross the Alto (the Florence’s river) and reach the Piazzale Michelangelo. This square offers a stunning panoramic view of the city! The one you can see on all the postcards indeed. Of course, as this square is filled with tourists, you will find there a coffee shop with a terrace where you can enjoy this amazing view. The price is a shame but if you are as tired as me after the little walk to arrive there (I have an excuse, my shoes were brand new! ), then you won’t care and you will pay without complaining. If you want enjoy the view at its best time, go there at sunset when the sun is going down on the city and the bells from the Duomo are ringing. It’s worth a visit. Believe me, you will remember this moment all your life. Great photos! I was wondering whether I can use your coffee photos above for my Facebook page ‘C is for Coffee’. The idea is to combine coffee, travel and photography. Basically just like in your photo. Obviously I can mention your name and the location where the photo was taken. Hope to hear from you soon and feel to like the page. Thanks! Follow Guillaume Avond's board Voyage Voyage on Pinterest.